How does this relate to the living wage? Well, as the Archbishop notes, Jesus did indeed teach that ‘the labourer is worthy of his hire‘ (Lk 10:7 cf 1Tim 5:18), but he never spoke of a statutory minimum wage, leaving it instead for employers to decide what is just and fair (and there are some stern scriptural denunciations directed at those who abuse and exploit [eg 1Kgs 21]). The Parable of the Talents is a paradigm for good employer/employee relations: those who work diligently get a pay increase; those who are indolent get sacked. The employer wishes to maximise profit, and those who work with him toward that end share in the proceeds of growth. There is no place for the peevish, inactive or obstructive. But further, Jesus expected his disciples to work for nothing: if they lived on gifts and charitable handouts (Lk 8:3), to serve in faithfulness was sufficient to share in the Lord’s happiness. It is worth remembering that the Parable of the Talents was addressed to the disciples: they kept the sacred deposit and were entrusted to preach the gospel ‘each according to his ability‘. (Mt 25:15). And Jesus expects an increase: there is no room for indifference or inertia. 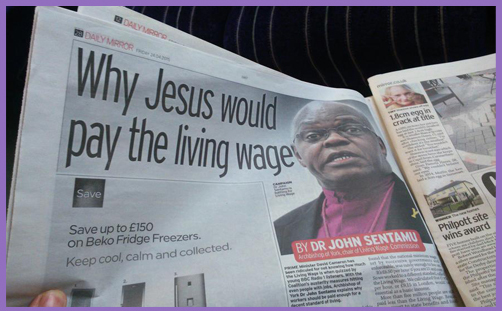 The only ‘living wage’ Jesus would pay is a Word-of-God sandwich smeared with the Spirit’s mayonnaise. If He were to advocate any wage and incomes policy at all, He would be far more likely to scrap National Insurance and Income Tax for the lowest paid, thereby permitting them to keep more of the money they earn. And then He might introduce Employer Allowances, making it cheaper for businesses to recruit and retain a workforce. He would deal with the annual deficit and rail against the national debt, which is robbing our children and grandchildren of billions of talents. And He would probably think Caesar’s policy of subsidising low pay through the issuing of tax credits and in-work benefits absolutely barking.